I might not refer to making Open Educational Resources (OERs) as “easier” but it is more familiar to educators than the idea of creating Assignments that are not “disposable”. He includes a few examples from his own teaching and others, including maybe the most prolific being UBC professor Jon Beasley-Murray’s Murder Mayhem and Madness project where his students sought not only to add ti Wikipedia’s gaps in articles in Latin American literature, but challenged his students to earn a coveted featured article status. I remember in 2012 interviewing another UBC professor, Tina Loo who also did a Wikipedia based project in Environmental history. She spoke of the fatigue of seeing the pile of essays she had to grade, knowing full well most of her students would toss them when the class was done. While David’s original post summarized a few examples where students produced original videos (a personal favorite of mine is the mashup of the Kennedy / Nixon debate as one about blogs vs wikis), it seems the majority of examples is more or less writing textbook-like content. While I am not interested in making yet another acronym, I feel some sarcastic resonance because my own career in educational technology has made an arc from the 1990s vision of Reusable Learning Objects to 20+ years later of Open Educational Resources. While they are not the same, I cannot help but wonder– have we moved far at all? I tend to agree with Jim Luke, we see a lot of focus on content. Why? It’s familiar. That is David Wiley himself, who is part of our Creative Commons Certification design team, at a working meeting we had in Toronto this past January. For some reason I had in mind the picture was him with his head in his hands in anguish, but he actually looks just like he is concentrating. A key aspect of our efforts to create a certification was to avoid something where competence is demonstrated by a multiple choice exam. We want participants to do activities that demonstrate application of the principles and tools of Creative Commons, to have them be relevant to a person’s work or interests, and to be seen openly in the world. Each one includes a Quest (aka “assignment”) and a place for people who complete them to enter a description and link to their work done to show their response to the quest. These are all publicly available if you want to explore. Note: The original Quests site has been deactivated, so all links now point to copies in the Internet Archive. I’m looking at David’s bullet point list under “Open Pedagogy” — we have some significant differences in that we are not offering class nor grades (though the certification itself may be the reward). In the Quest Bank we do have the place for a clear description, which can include media, links etc (see example) and all responses are appended to a Quest as “a variety of worked examples” — and it grows as the use of the bank does. Anyone can vote on the “public rating” which can be used as sorting mechanism to find quests. While remix activities are not strictly built in, it could be incorporated in any Quest’s instructions. And a feature we have that is not on the list is anyone on the site has ability to create a new quest (no longer available, sad). It takes a lot of effort to move past the first impulse of writing ones that sound like they are answering a question or a series of questions. Those have an odor of “disposable-ness”. Another consideration is considering whether just publishing something into the open makes it renewable e.g. the suggestions of an activity of “adding something you created to the Commons”. It’s potentially useful, but seems on the lower end of the spectrum. 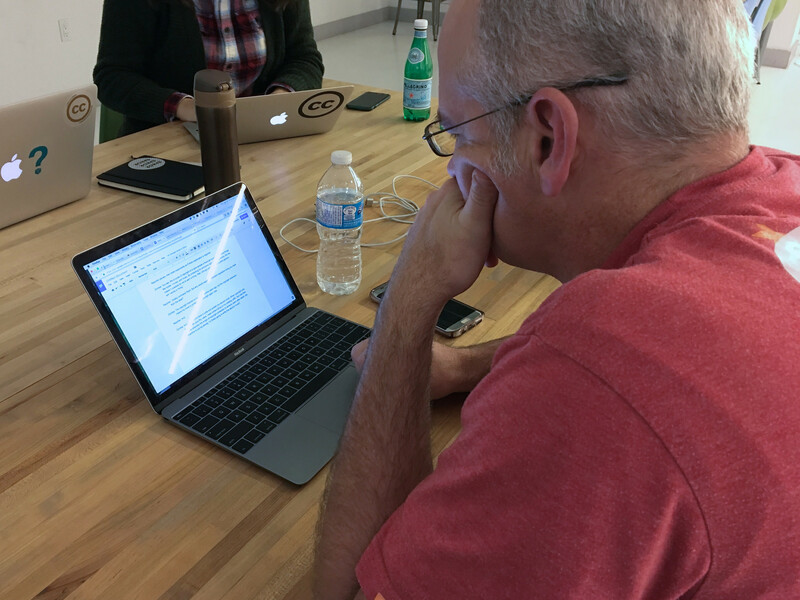 On the first days of our January team meeting, I heard many sighs from David as he described possible ideas and tried writing them up as quests. And then a loud exclamation, “Not only do I have to write it up, I have to do one as an examples!” I tease him here only slightly, he did really take this challenge on and his approach shifted over the next few days. I by no means am criticizing David’s ability to come up with creative assignments- he has a long career of doing this, and doing it openly. But I think the task changes when it’s not in the scope of a class (different participant motivation) and more so when you may never have direct contact someone trying your assignments. So I do not want to boast that I have all the answers, but this has been at the core of a lot of my teaching and faculty development work, having created, edited, reviewed hundreds of ones in the original DS106 assignment bank, developing “Studio” activities and challenge bank assignments for the UDG Agora Project, and the hundreds of smaller activities created for the DS106 Daily Create, and similar ones for a faculty development program at Thompson Rivers University, again for the UDG Agora Project, and currently for the Networked Narratives course. WikiShootMe: Add a Photo to WikiData Commons as part of the Unit on Significance of the Commons. A bit off the beaten track of editing Wikipedia Content, this uses location data, maps to solicit photos that a person has taken themselves that can be added to the data back end (WikiData Commons). The idea is to use a map that shows places near you (or any location you have photos for) and it shows places needing imagery. It’s maybe a tad complex? Aspects of Physical vs Digital Sharing is meant to help appreciate how the sharing of digital content differs from things you own. It’s a thinking exercise where i asks you to consider sharing a real physical object you own (book, art, music), and calculate what it would take to actually send it to someone far away, what would change if it was digital, what would change if you wanted to share with more people. It’s sort if a worksheet done in Google docs, so maybe the sharing and adding to the public good levels are low. But it’s more than an essay. Create an Elevator Pitch for Why Open is Better or Why Open is Better as an Infographic are both part of the Socio-Cultural Module. They are options for the same unit (I wanted to demonstrate how one unit could have multiple possibilities as choices for participants). These are nothing earth shattering, but I added an element beyond creating a video or an infographic in that it asks the participant to then try it out on a colleague and collect feedback, put it out there in the world, and not just the digital. I am too challenged for some of the units to come up with an activity (hence we we hope others might chip in and create their own). But because the work of Creative Commons is done in the open, we feel the work people do should be there too. And I am less interested what we call these things, and more interested in just trying to create and have people try them out. Got thoughts, ideas? I’m just talking out loud here. I’m looking forward to achieving a Creative Commons Certificate. This says more about the schools I’ve attended, but no teacher has ever spent thirty minutes grading one of my assignments. I think the best teachers I’ve ever had spent a little more than thirty minutes on a semesters’ worth of my work. I graduated from one of the worst high schools in America. (President Reagan visited a decade after I graduated and proclaimed it the most improved HS in the country!) My California Community Colleges are on a list of America’s Worst Community Colleges too. I, too, have struggled with NDA’s, for classes and outside of classes. I am not sure these really fit your purposes, but we have come up with some “challenges” that we use in workshops about open ed, OER, open scholarship, and more. We used your assignment bank theme. Here they are in case any are helpful! Thanks Christina- the UBC themed version of he assignment bank is one of the best I’ve seen (I tend to keep mine pretty plain). Thanks for the reminder, as I might borrow some of them for the CC project. I’m more interested in how we can help people get out of the NDA box. No disagreement here, and I am probably saying the same thing without the proper lingo. It’s not the terminology, but I bet even the process of developing authentic assessments is as challenging as NDAs. I wonder too about the concept of being “assessed by” that it’s something done to a learner vs an assertion of the learner that they have achieved those authentic skills. When I think about this concept without a clear name, to me it needs to be than doing an assignment and posting it openly. To me, non-disposable and renewable involve taking something old that someone has already created and modifying, retooling or repurposing. I like those ideas. I’d say there’s a wide suite of approaches. Most of my teaching has been media, which lends itself to these kind of remixes of other’s works. I also like to play some with performative aspects, like it’s not enough to do an infographic, but you have to present or get colleagues to engage with it, collect feedback (?). And the other side is when students do parts that are beyond the “assignment” just based on their own interests or curiosity. It’s look blowing out the doors of the rubric. I’m using Wikipedia to get Masters students (in Marketing) in Loughborough University to add 500 words to existing wiki articles so I found the above interesting. However there were some broken links (e.g. 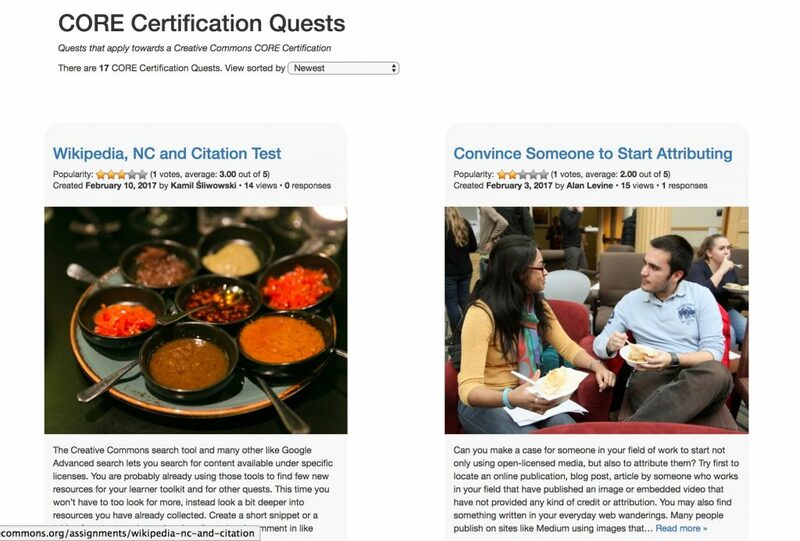 https://certificates.creativecommons.org/quests//assignments/elevator-pitch-open-better). Last year the students were intrigued when I printed out their additions using a Wikibook and presented it to “the winner”. A real hook for them (and the department) was that their assignments were being read every 14 seconds. <- I calculated by this by just adding together the hit rates for the articles that they had added/created. Thanks for sharing your wikipedia idea- I really like the part of assembling the contributions as a Wikibook and may use it for an upcoming faculty development session on the Wikipedia ecosystem. Yes, unfortunately, the Quests web site was deactivated after I left the project; I am updating those links to point to ones in the Internet Archive. Get Centered, Wordpress Auto Embedded Tweets!